When questioned in Senate Estimates in 2013, CSIRO confirmed that it has received a further 10 allegations about inappropriate behaviour by a senior employee but had failed to investigate because those people had not formally complained. It is still gob-smacking that to this very day employers such as the CSIRO can and will bury their heads in the sand in relation to such serious allegations. Hagar’s published briefing is reproduced in full below. Senior astronomers have accused CSIRO of failing to address a culture of bullying and sexual harassment in its astronomy department. The organisation has conducted 16 investigations into alleged professional misconduct in the department since 2008, including an allegation of sexual assault and a case that involved the police. The situation makes one astronomer so concerned she hesitates before sending her students to parts of the department. “It bothers me because of the fact that they could go on and reoffend without us being able to protect those potential future victims,” said the ANU’s Naomi McClure-Griffiths, a former senior member of the department and one of Australia’s top radio astronomers. “I’d hate to be the person who sent a student to go work with somebody and have them turn out to become a victim of harassment, and know that I could have prevented it. 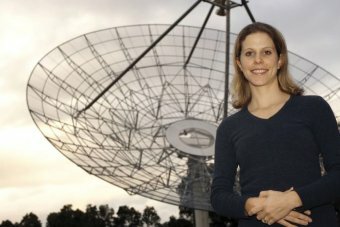 She spoke to Background Briefing to condemn CSIRO’s handling of an investigation that led Dr Ilana Feain, one of the brightest stars in Australian astronomy, to quit her tenured job and leave astronomy altogether. In 2012 Dr Feain filed a lengthy formal complaint in which she accused a senior colleague of unprofessional and inappropriate personal attention over several years. The internal investigation that followed was confidential, and so were the findings; Dr Feain is barred from discussing them. The accused colleague was counselled and an adverse finding was placed on his file. He remains in his senior position. “I’m still very angry about what happened to Ilana,” said Bryan Gaensler, an astronomy professor who worked closely with Dr Feain. Professor McClure-Griffiths said CSIRO’s confidentiality provisions serve to protect those accused. “The secrecy that’s put on around this … it only ever helps the perpetrators,” she said. CSIRO was dogged for years by allegations of bullying, but a 2013 investigation by former Commonwealth ombudsman Dennis Pearce found “no major problem of workplace bullying or other unreasonable behaviour”. 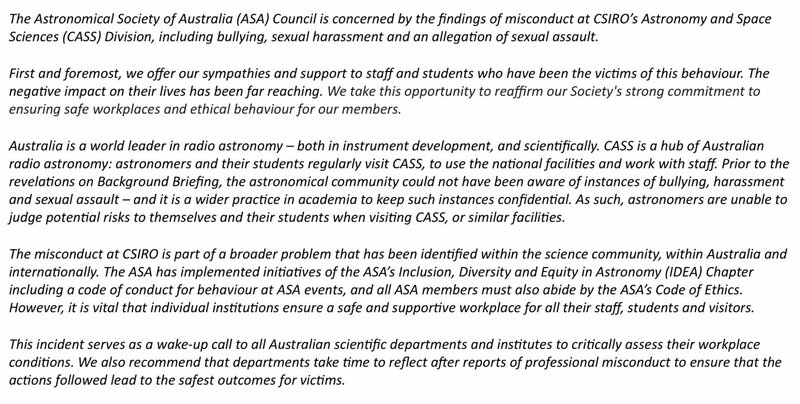 CSIRO executive director Dr Dave Williams, who is in charge of the astronomy department, denied the level of secrecy was improper or that adverse findings had not been met with serious consequences. “They’re confidential staff issues, and that’s the way it remains, and that’s the way all organisations work in these areas,” he said. Hear Hagar Cohen’s full investigation for Background Briefing on Radio National at 8:05am on Sunday, or subscribe to the podcast on iTunes, ABC Radio or your favourite podcasting app.